Jarett Juma Porter Dillard (born December 21, 1985) is an American Lawyer and former American football wide receiver of the National Football League. Dillard achieved success as a college football player for Rice, while earning his Bachelor's degree in Political science. He was drafted by the Jacksonville Jaguars in the fifth round of the 2009 NFL Draft. Following his NFL career, Dillard embarked on a successful legal career. He attended the South Texas College of Law, attaining his Doctor of Jurisprudence (J.D.) degree. Dillard is an attorney and currently practices law in the State of Texas. Dillard was born and raised in San Antonio, Texas, the son of Porter and Robin Dillard. He has two siblings. All three are spectacularly high academic achievers. Jarett was a valedictorian and Tai was a salutatorian at Sam Houston High School. Darik ranked third in his class at McArthur High School. The Dillard sibling triad is known for their exceptional athletic abilities. Sister Tai is a former basketball player of the Women's National Basketball Association (WNBA), where she played for the San Antonio Stars. Tai also played basketball for The University of Texas at Austin, while earning her Bachelor of Science in Kinesiology. Presently Tai is Assistant coach of the University of Houston's Women's basketball team. Brother Darik currently plays football for Rice University, while earning his Bachelor of Science in Mechanical engineering. In the 2005 season, Dillard captured national attention as no other Rice Owls football player had done. He shattered school receiving records on the way to becoming a finalist for the Biletnikoff Award, given to the nation's top receiver. ESPN's All-America first-team pick broke the NCAA season record for consecutive games with at least one touchdown catch. As a redshirt sophomore in 2006, he helped lead Rice to its first bowl game in 45 years (1961 Bluebonnet Bowl). Rice closed the season on a 7-1 run, capped by a come-from-behind victory over SMU to clinch a bowl game. During those 8 games, Dillard caught 55 passes for 826 yards and 16 touchdowns. In 2006, Dillard was named a finalist for the Biletnikoff Award, a first team All-American by ESPN, a second team All-American by Sports Illustrated, a second team All-American by the Walter Camp Foundation, a second team All-American by Sporting News, and a second team All-American by the Associated Press. At one point Dillard had a streak of 15 straight games in which he had caught a touchdown pass, leaving only Larry Fitzgerald, who had 18 in a row, in front of him. In the New Orleans Bowl, Dillard caught a touchdown pass in the fourth quarter to set a new record for games with a touchdown in a single season (13), besting the mark he shared with Fitzgerald and Randy Moss of 12 games in a season. In 2006 he caught a total of 21 touchdown passes, which set both Rice and C-USA records. On four separate occasions (Army, UAB, Tulsa, and SMU) he caught three touchdown passes in the same game. He also accumulated 91 catches for 1,247 yards, including 7 games with at least 90 yards: UCLA (102), Texas (91), Florida St. (113), Army (171), UAB (111), Tulsa (137), and SMU (145). In 2007, Dillard caught another 14 TD passes, earning 1st team C-USA honors and being mentioned by several publications as all-American honorable mention (including 4th team selection by Sports Illustrated). Dillard is one of only 8 players to catch 40 TD passes in a career, a feat he accomplished when he was only a junior. Dillard holds the NCAA record for career touchdown receptions with 59, eclipsing the prior mark of 50 set by Troy Edwards. Dillard and Rice quarterback Chase Clement hold the NCAA Division I-A record for career touchdowns between a quarterback-receiver tandem with 50. This total does not include the touchdown pass thrown by Dillard to Clement during the final game for both Rice Seniors in the 2008 Texas Bowl. After his senior year, he became then first Rice player to be named to the Football Writers All America team in 50 years (Buddy Dial in 1958). 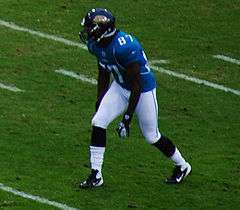 Dillard was drafted by the Jacksonville Jaguars in the 5th round of the 2009 NFL Draft. He is the second Rice player to be taken by Jacksonville after Brandon Green in 2003. On July 17 he was signed to a contract. Length and terms of the contract were undisclosed. As a rookie, Dillard caught six passes for 106 yards before suffering a broken ankle against the Jets in week 10 of the '09 season. Dillard was placed on the injured reserve list on September 11, 2010 due to a foot injury and did not play a down that year. Dillard was released by the Jaguars on May 7, 2012. Dillard signed with Detroit on June 16, 2012, but was released on August 27, 2012. Dillard signed with the Arizona Cardinals on April 24, 2013. He was waived after given an injury settlement on August 24, 2013. 1 2 "Jarett Dillard". NFL.com. Retrieved 2016-05-31. 1 2 3 "People on the Move (Jarett Dillard)". May 2, 2016 – via Houston Business Journal. 1 2 3 4 "Darik Dillard Bio". Rice University Official Athletic Site. Retrieved May 31, 2016. ↑ Duarte, Joseph (9 October 2013). "Dillard following in brother's footsteps at Rice". San Antonio Express News. Retrieved 14 October 2013. ↑ "Examinees who passed the February 2016 Texas Bar Examination" – via Texas Board of Law Examiners. 1 2 3 4 "Jarett Dillard Bio". Retrieved May 31, 2016 – via Rice University Official Athletic Site. ↑ Alexander, Joe (September 15, 2010). "High school players follow famous footsteps" – via San Antonio Express News. 1 2 3 "Assistant Coach Tai Dillard Joins Women's Basketball Coaching Staff". UH Cougars Women's Basketball. University of Houston (UH). May 6, 2014. 1 2 "Biletnikoff Award Finalists". Tallahassee Quarterback Club Foundation, Inc. Retrieved May 31, 2016. ↑ "National Football League: NFL Draft 2009 - Jarett Dillard". NFL. NFLDraftScout.com. Retrieved May 31, 2016. 1 2 3 "2006 AP All-America Team". ESPN. Associated Press. December 12, 2006. Retrieved May 31, 2016. 1 2 "Jarett Dillard Stats (College)". ESPN. Retrieved May 31, 2016. ↑ Richardson, Steve (December 13, 2008). "FWAA NAMES 2008 ALL-AMERICA TEAM". Retrieved May 31, 2016 – via Football Writers Association of America. 1 2 "SI.com's 2008 All-Americans". Sports Illustrated. December 16, 2008. ↑ Oehser, John (December 21, 2011). "Courageous comeback" – via Jacksonville Jaguars. ↑ Pool, Chuck (June 30, 2015). "Rice Announces 2015 Hall of Fame Class" – via Rice Owls' Athletic News. ↑ Ganguli, Tania. "Jaguars release 2009 draft pick Jarett Dillard". The Florida Times-Union. Retrieved 7 May 2012.